Twitter’s mobile app needs help. Of all of the social networks, engagement on Twitter is dismally low. Even the people who like the app don’t spend nearly as much time on Twitter as they do on other social media. There are some obvious problems with the app that Twitter could fix, but they don’t. Which one will you click? Until a few months ago, Twitter’s iPhone app didn’t support badge notifications. 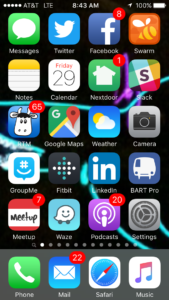 A badge is the small red number that appears on the app’s icon letting you know that you have Notifications. Twitter’s iPhone app didn’t have them. You could look at your phone’s screen and see that Facebook, LinkedIn, MeetUp, and NextDoor had messages waiting for you, but not Twitter. A glance at your screen and the small red numbers taunt you – Check FaceBook! Check your email! Check Messages! Badges are a simple way to get you to start up that app and engage. With a recent update, Twitter finally added badge notifications. Only problem is, they don’t actually work. The badge will appear with a “2” on it, I’ll start the Twitter app, and the “Notifications” icon indicates that there’s something new. I click it, and there are no updates. I can check the “Me” link and see that I have 2 more followers, but they’re not listed on the Notifications screen. If I log into the TweetDeck web app I can see who the new followers are, but the iPhone mobile app pretends they don’t exist. Ever have a conversation with a friend on Twitter? It’s next to impossible to follow replies, comments, or have any sort of conversation using the tools they provide on their mobile app. If Twitter wants to increase user engagement, they should get rid of the Messages tab and make it a “Mentions” tab that shows private messages and allows for threaded conversations. Alternately they could add a “swipe left” feature or even a “view replies” icon to view the replies to a message, in threaded order. Make it possible for people to have a conversation about the things that they’re posting, and they’ll stay on engaged for longer. The Home button shows me the latest messages from everyone I’m following in order by time posted. What if I want to see the posts with the most retweets? Or the most hearts? Or the most replies? You know, the messages from the people I’m following that are the most interesting/funny/relevant? Get rid of the “Moments” section and give me a “Trending” section that shows the items from the people I follow with the most retweets, likes, and replies. I guarantee I’ll spend more time in that section than I do looking at “Moments”. Since mobile data service is spotty, you’d think the Twitter app would start downloading items for my “Home” feed as whenever I have a signal, so I’d never run out of items to read. Unfortunately that’s not the case, and I routinely hit the end of the list of things on “Home” to read just as BART enters another AT&T dead zone. I sit there watching the spinner for a few seconds, then quit Twitter and load another app – one that was smart enough to download content in the background so it’s ready for me to view. I only follow 361 people on Twitter. Each one of them has a small profile picture that rarely gets updated, so why does Twitter download and render a the same, identical profile photos every time I open the app? I’ll be scrolling along, and I can see it download and render the photos one by one. If I’m in an AT&T dead zone, I’ll just see a bunch of empty boxes instead of profile pictures in my feed. How hard could it be to cache a copy of the photos on my phone? The app can always check for new photos and update them if one is available, so why is it downloading them every time I open the app? If I don’t have a connection at the moment it’s OK to show me someone’s 24-hour-old profile picture – it’s better than showing me an empty box. That’s it. 5 simple things that Twitter engineers could fix this week to increase the amount of time people spend using their mobile app. Full disclosure: I own shares of Twitter stock. If someone at Twitter fixed these problems I might be making less of of a loss on those shares. In addition, the Twitter stockholders meeting is this week. I won’t be there, but if you are feel free to share this article with the people in attendance.